Rich, do you still recall your automaton solution? I know you probably wouldn’t want to spoil it, but the idea sounds lovely. I’ve also tried writing several stories on this topic–a fascinating one. Have you ever read magician Ricky Jay’s book on the subject? P.S. Please come back–you and I may disagree on this or that, but I love the blog! Hi Karl. Thanks for the kind comment! I’m hoping to return to blogging soon, but I’m just so busy. I’ve actually been working on my Caissa story a bit this year. It’s now an epistolary novel set during the Congress of Vienna, so there’s a lot of research to do, but the central impossible crime and solution remains the same. 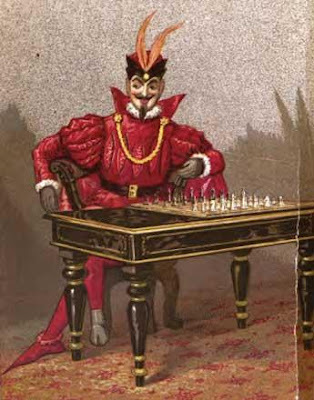 The Turk comes up in a lot of places, of course, but I haven’t read any books dedicated to it or other chess automata. Is Ricky Jay the American who built a replica Turk? I think I’ve seen some YouTube videos. Congratulations on the story’s progress, and I won’t ask you any more questions about it, then. (For this one, we shall regard spoilers somewhat… 🙂 ) An epistolary novel set during the Congress of Vienna sounds fantastic. I understand about the busyness, and I hope all’s going well. I agree with you completely that there needs to be a space to discuss the techniques of the detective story, including spoilers, more than simply reviewing. As for Jay, he remains one of my favorite magicians of all time; for all that he was inspired in technique from Cardini and (especially) Dai Vernon, his talent remains remarkable, and, even when I know how the trick is done, I can never see Jay’s slight of hand. That is the sign of a master. The book is Jay’s Journal of Anomalies. Excellent background material for the budding mystery writer; Carr would have loved it.